Buyers looking for larger detached homes are attracted to this neighbourhood because of its preponderance of sprawling “estate-like” properties, charming traditional architecture and rolling tree lined streets. This is a uniquely beautiful park with a natural stone backdrop, nature trails of varying lengths and stunning views of the city and Lake Ontario from atop the cliff. It’s the perfect setting for family walks or a first date! The rolling hills and grand estate lots are perfect for those who want neighbours but don’t want to have to chat in the driveway on the way to work. A golf course smack dab in the middle of the neighbourhood. For those who are into golf this is ridiculously awesome. For everyone else it’s just a big pretty thing to look at. Doesn’t hurt the property values either. Ok, so not many people have these toys, but watching these guys fly these things on the weekend just might inspire you. Cityview Park is one of the newest and largest parks in Burlington, with a fantastic creative playground space, 3 artificial turf fields with lighting for sports, and natural spaces for scenic walks. Definitely worth a visit. 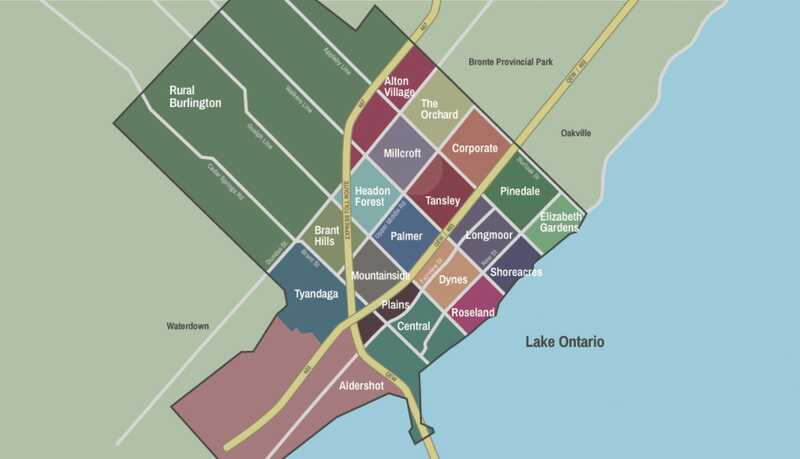 How much does it cost to live in Tyandaga? Your typical neighbours are a mix of families and retired couples. Driving to Toronto from Tyandaga takes approximately 40 minutes. However, during rush hour the time you spend in the car could increase to approximately 1 hour 15 minutes. Using the Burlington GO Station is a huge benefit to local residents and gives commuters a consistent travel time to Union Station of 53 minutes. Tyandaga is also uniquely situated close to several major arteries (the 407, 403 and the QEW). Is Tyandaga Perfect for You? Tyandaga is a beautiful, mature neighbourhood located on the northwest side of Burlington. Buyers looking for larger detached homes are attracted to this neighbourhood because of its preponderance of sprawling “estate-like” properties, charming traditional architecture and rolling tree lined streets. Because Tyandaga is built on a hill, many of the homes have beautiful views of the city and Lake Ontario. Development of this area began in the 70’s and was completed in the 90’s. Some of the streets have smaller bungalows and split level floor plans that are perfect for young couples and families. But, most of the homes in Tyandaga are large two stories with the traditional centre hall plan and a double garage. Because Tyandaga is built on a hill, many of the homes have beautiful views of the city and Lake Ontario. Tyandaga is the perfect neighbourhood if you are looking to live in a quiet location on the outskirt of the city, but still want to have access to shopping and transit. This neighbourhood is surrounded by green space and spectacular parks with many homes backing onto the beautiful 18-hole Tyandaga Golf Course. Many buyers overlook Tyandaga as being “too far”. However, if you need to commute to work, Tyandaga is actually very well situated next to a major junction that connects several highways. Whether you are traveling to Toronto, Mississauga, Hamilton or the Niagara area, a major highway is just moments away. Possibly it’s only downside is the fact that Tyandaga doesn’t have a school immediately within its limits. Children in this area are bused to one of the surrounding neighbourhood schools.